Augment your outdoor lifestyle and complete your camping gear with this low cost but high quality forged metal spiral anchor. Secure small tents, canopies, landscape items or outdoor covers in your backyard or use them to tie down and protect your outdoor belongings from wind damage during a storm or hurricane. The hardened pointed lower end of the screw can penetrate all types of earthen surfaces. Simply pass the rope or harness through the 4x5 cm foldable fastener metal ring for anchoring your tent, marquee, camper, canopy, trampoline, play set, and other outdoor equipment...within minutes! Multi-packs include torque bar and carrying sack. Solid rolled steel construction allows the heavy duty 40.64 cm (16 inches) solid metal spiral soil anchor and ring to withstand up to 475 lbs of pull force. It prevents your tents, tarps, or other outdoor items from flying away in the wind. Suitable for all weathers and terrains. The eye catching bright blue rust-resistant powder coating provides excellent visibility and protects the hardened steel earth screws from the elements, making them suitable for all types of weather. The flat metal top of the anchor flushes with the ground's surface and the hard metal loop folds down to minimizes the above-ground profile, making GrayBunny spiral ground anchors safe against tripping hazards. Designed and manufactured by camping and outdoor experts using premium quality materials and tools. GrayBunny offers premium products for your home, lawn and garden while exceeding highest industry standards and offering impeccable customer care. If you'd like your money back at any time within 1 year of purchase, no worries. Anytime. Just ask. Click the "Add to Cart" button on top to secure your outdoor covers, fixtures and camping gear now! MULTI-PURPOSE: Augment your outdoor lifestyle and complete your camping gear with this low cost but high quality forged metal spiral anchor. Secure small travel trailers, cabins, chicken coops, garages, small buildings, deer stands, fencing and fence ports, trees, vertical hammock stands, landscape items or outdoor covers in your backyard. 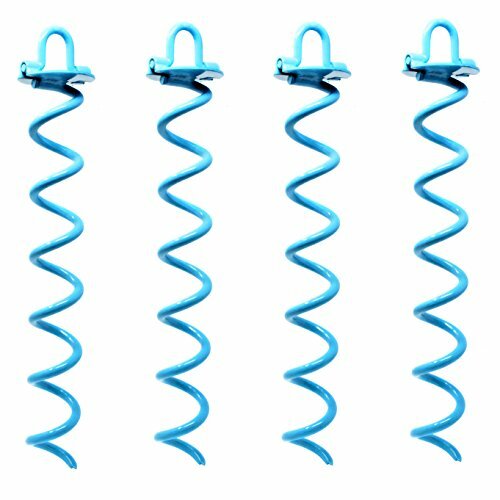 Or carry these rugged and compact ground screw anchors to the beach or camping ground on your next trip. Multi-packs include torque bar and carrying sack. SOLID ROLLED STEEL CONSTRUCTION: The heavy duty 60.64 cm (16 in) solid metal spiral soil anchor and ring can withstand up to 475 lbs of pull force. Prevent your outdoor items from flying away in the wind. Or use several of these ground anchors for installing and retaining kids' swingsets, dog house, slides, playground playsets, other light weight fixtures in your lawn or backyard. Great for protecting your ATV, boat, motorbike, or other outdoor belongings during a storm or hurricane. SUITABLE FOR ALL WEATHERS AND TERRAINS: The eye catching bright blue rust-resistant powder coating provides excellent visibility and protects the hardened steel earth screws from the elements, making them suitable for all types of weather. The top of the anchor flushes with the ground's surface and the hard metal loop folds down to minimizes the above-ground profile, making GrayBunny spiral ground anchors safe against tripping hazards. Soil type & moisture may affect the sustainable pull force. SIMPLE, SAFE AND PRACTICAL: Easily screw the powder-coated wrought iron ground screw anchor into any hard or soft ground. The hardened pointed lower end can penetrate all types of earthen surfaces and gets imbedded with a few rotations. Simply pass the rope or harness through the 4x5 cm foldable fastener metal ring for anchoring your tent, marquee, camper, canopy, trampoline, play set, and other outdoor equipment...within minutes! Available in 25.4 cm (10 inches) and 40.64 cm (16 inches) models. GUARANTEE: GrayBunny offers premium products for your home and garden while exceeding highest industry standards and offering impeccable customer care. If you'd like your money back at any time within 1 year of your purchase, just ask. Click the "Add to cart" button to complete your outdoor gear with the sturdy and stylish spiral ground anchors now!